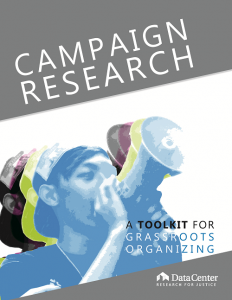 The Campaign Research Toolkit is a how-to guide for grassroots organizations conducting community-driven campaign research. It’s the product of over ten years of experience working with grassroots organizations to develop strategic and effective campaigns for change. The toolkit contains user-friendly activities, worksheets, and case-study discussions that demystify the process of campaign research for organizations and their membership. Why do we need strategic campaigns? Campaigns are essential tools for organizing communities to develop their power to create social change. We build campaigns as a coordinated and methodical way to confront decision-makers and inform policies that shape the lives of our communities. The tools in the Campaign Research Toolkit are the same ones we currently use in our Research for Community Power Program. With these tools, we’ve worked with marginalized communities to strengthen organizing efforts, empower the dis-empowered, and, in some cases, win important policy changes. passing the San Francisco Wage Theft Ordinance. We hope you, your organization, and/or your community find the Campaign Research Toolkit an essential resource in conducting strategic campaign research and building a strong, organized, and mobilized support base to achieve the change you want to see. Download and share this free toolkit today. *If you enjoy this toolkit, be sure to check out our other toolkits: An Introduction to Research Justice and, Our Voices, Our Land: A Guide to Community-based Strategies for Mapping Indigenous Stories. Toolkits like these are made possible by donors like you. Thank you for allowing us to provide these free and accessible tools to the folks who need them most!